338 Euston Road, London NW1 3BH. I personally find autobiographies written by recently retired cricketers preferable as presumably there are fewer restrictions and they can be more open. I therefore was quite encouraged to see that Graeme Swann's autobiography made the news soon after its launch for some of the comments made within it and that the England coach, Andy Flower, suggested that current cricketers bringing out books was not a good idea. This hefty book certainly does not disappoint. Written in conjunction with Richard Gibson, the first thing I noticed was how refreshingly open this book is written. It may, I suppose, ruffle a few feathers but the impression I got was that Swann predominantly says what he sees and the frankness is, in my view, praiseworthy. 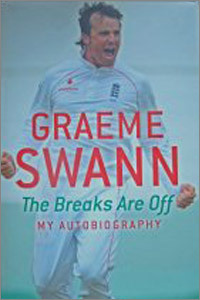 The well-known confidence comes through in this illuminating book but Swann does accept that, at times, his personality did not always help and hence his first England tour was not a success and he was left out in the wilderness for years afterwards. He freely offers his opinions about captains and coaches and I had expected to read the piece on Pietersen's captaincy which made the news and wonder what the fuss was about. Instead, I was surprised to see how forthrightly not only that piece but the book in general has been written. Some people may not like this approach but I personally found it refreshing. Andy Flower may have a valid point but I have very much enjoyed this book. In a book of almost four hundred pages, naturally most areas seem to be well covered and there is a liberal selection of photos concentrating primarily on his success after returning to the England team after a long gap. We also learn of his musical aspirations and his family life. Lest we forget, his brother Alec was also a county cricketer before moving direction. Victor Isaaacs has produced a splendid resume of Swann's career. His Test, ODI and First-Class career statistics are mentioned in great detail as are his Test records at each ground and against all oppositions against whom he has played. There is also an interesting section with a brief resume of each Testand ODI he has played in, his performance in those Tests and ODIs and the Man of the Match. It is a very thorough statistical section and most interesting. This is a most entertaining book and a fine record and I would wholeheartedly encourage anyone to read it.